You’re a busy student on the go, and tomorrow you have a major exam right around that time of day you typically feel a little hungry and spacey. You know what you need? A snack! But not just any snack. Sure, a large coffee or a sweet treat might give you a spike in energy, but that’s just the caffeine or the sugar talking. To perform at your very best, you need something that will crush hunger and give your brainpower a boost. So we asked nutritionist Marlo Mittler, MS, RD, for healthy snack ideas that will keep you going—and just might help make you smarter. Blueberries. Studies have shown that blueberries can improve thinking and memory skills, which is likely thanks to the flavonoids (a kind of antioxidant) they’re packed with. So feel free to snack on a bowl of fresh berries, or try dried blueberries for a sweet and portable treat. Hard-boiled eggs. Make a habit of having hard-boiled eggs in the fridge for an easy grab-and-go snack. Eggs not only give you hunger-crushing high-quality protein, “they’re also rich in choline, which enhances memory and learning,” says Mittler. An apple with almond butter. “Apples have a slow-digesting natural sugar that gives you an energy boost without the drop-off you’d get with other sweet foods,” says Mittler. Adding creamy almond butter gives you protein and vitamin E, both of which aid memory. Nuts. 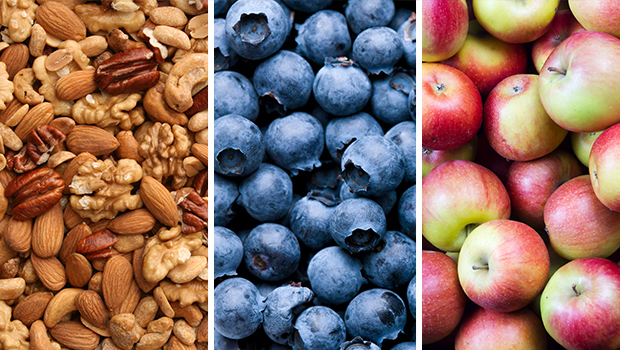 Nuts of all kinds are rich in vitamin E, which may help protect your brain against age-related decline. They’re also a good source of hunger-crushing healthy fats. Whether you buy a pack in your café or make a mix at home, keep an eye on portion size. Nuts are loaded with nutrients, but they’re also high in calories. Aim for one ounce, which is about a small handful. Salsa with fresh veggies. Make your snack a fiesta, but without the chips. Tomato-rich salsa is a great source of lycopene, which plays a role in keeping your brain focused. Add carrots or pepper strips for crunch and an extra dose of vitamins. Whole-grain crackers and cheese. The key benefit of whole grains is that they keep your energy level consistent, says Mittler. Pairing your crackers with low-fat cheese adds protein, as well as vitamin D, which is a crucial nutrient for brain health.